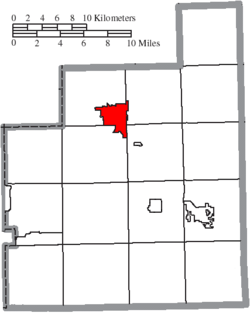 Chardon is a city in and the county seat of Geauga County, Ohio, United States. The population was 5,148 at the 2010 census. It is the only incorporated city in Geauga County, and includes land that was once part of Chardon, Hambden and Munson townships. It is located about 10 miles south of Lake Erie and within the "snow belt" of the Great Lakes. Chardon is named after Peter Chardon Brooks, who donated land to build the historic Chardon Square. Chardon Township celebrates its incorporation in 1812, and thus the City of Chardon does the same. On July 24–25, 1868, a massive fire totally destroyed the center of downtown, the area now known as Chardon Square. The fire originated in the Parlin Parkin's grocery store, and spread rapidly. By the time the fire was contained, the courthouse, post office, and many stores on the square were destroyed. Damage was estimated at around $120,000. On February 27, 2012, a student from Lake Academy, opened fire at the Chardon High School cafeteria, killing three, and injuring two students. Daniel Parmertor, 16 years old, was killed at the time of the shooting. Two other victims, Demetrius Hewlin and Russell King, Jr., were pronounced dead on February 28. The shooter was taken into custody by police and was charged with three counts of aggravated murder. He was sentenced to three consecutive life terms in prison without parole. Chardon is located on U.S. Route 6 about 30 miles (48 km) east of Cleveland. According to the United States Census Bureau, the city has a total area of 4.62 square miles (11.97 km2), of which 4.58 square miles (11.86 km2) is land and 0.04 square miles (0.10 km2) or about 25 acres (10 ha) is water. With an average annual snowfall of 107 inches (272 cm), Chardon is notable for being the snowiest city in Ohio. This is mainly due to its location on a 730-foot (223 m) ridge approximately 10 miles (16 km) inland from Lake Erie, creating the perfect conditions for orographic lift and its associated heavy snowfall when winter winds blow across the lake. In 1996, from November 9 through November 13, a storm dropped over 70 inches (178 cm) of lake-effect snow in the city over a period of six days. Governor George Voinovich declared a state of emergency as a result, and the Ohio National Guard was brought in to assist with the cleanup. As of the census of 2000, there were 5,156 people, 2,147 households, and 1,344 families residing in the city. The population density was 1,120.1 people per square mile (432.8/km²). There were 2,271 housing units at an average density of 493.3/sq mi (190.6/km²). The racial makeup of the city was 97.77% White, 0.43% African American, 0.02% Native American, 0.45% Asian, 0.02% Pacific Islander, 0.10% from other races, and 1.22% from two or more races. Hispanic or Latino of any race were 0.47% of the population. There were 2,147 households out of which 30.5% had children under the age of 18 living with them, 49.7% were married couples living together, 9.9% had a female householder with no husband present, and 37.4% were non-families. 32.9% of all households were made up of individuals and 13.7% had someone living alone who was 65 years of age or older. The average household size was 2.35 and the average family size was 3.02. In the city the population was spread out with 24.9% under the age of 18, 6.9% from 18 to 24, 29.9% from 25 to 44, 22.5% from 45 to 64, and 15.8% who were 65 years of age or older. The median age was 37 years. For every 100 females, there were 84.9 males. For every 100 females age 18 and over, there were 79.3 males. The median income for a household in the city was $54,063, and the median income for a family was $57,845. Males had a median income of $44,071 versus $23,750 for females. The per capita income for the city was $21,845. About 1.3% of families and 3.8% of the population were below the poverty line, including 0.6% of those under age 18 and 7.8% of those age 65 or over. As of the census of 2010, there were 5,148 people, 2,285 households, and 1,331 families residing in the city. The population density was 1,124.0 inhabitants per square mile (434.0/km2). There were 2,457 housing units at an average density of 536.5 per square mile (207.1/km2). The racial makeup of the city was 96.9% White, 0.8% Black, 0.2% Native American, 0.6% Asian, 0.2% from other races, and 1.3% from two or more races. Hispanic or Latino of any race were 1.5% of the population. There were 2,285 households of which 29.1% had children under the age of 18 living with them, 42.1% were married couples living together, 12.2% had a female householder with no husband present, 3.9% had a male householder with no wife present, and 41.8% were non-families. 37.4% of all households were made up of individuals and 15.8% had someone living alone who was 65 years of age or older. The average household size was 2.21 and the average family size was 2.94. The median age in the city was 41.1 years. 23.5% of residents were under the age of 18; 7.4% were between the ages of 18 and 24; 24.8% were from 25 to 44; 26.5% were from 45 to 64; and 17.7% were 65 years of age or older. The gender makeup of the city was 45.1% male and 54.9% female. Chardon is known for its maple syrup industry. Celebration of the syrup season begins at Tapping Sunday in March, when the sap is at prime thawing temperature. The annual Geauga County Maple Festival is a four-day celebration that takes place on the Chardon Square the last weekend in April. The festival has been rescheduled numerous times because of snowstorms in April due to Chardon’s location in the “snow belt” of the Great Lakes; it receives a large amount of snowfall every year. Chardon has an active performance art community. The Geauga Lyric Theater Guild is housed in the renovated Geauga Theater building, which was constructed in 1939 as an Art Deco movie house. The theater is also being used again to show first-run movies. Greater Chardon features numerous parks and golf courses. Chardon Lakes Golf Course is located in the heart of Chardon, two minutes from the square. Sand Ridge Golf Club in nearby Munson Township is also an excellent course. Chardon has an abundance of park space. Due to the area's varying weather conditions, sports activities are available for every season. The 1987 Film, Planes, Trains, and Automobiles had a scene filmed in Chardon. The scene where Candy and Martin are riding in the back of the pickup truck was filmed on Taylor Wells Rd in Chardon. Chardon and the area surrounding the city are served by the Chardon Local School District. The district contains Chardon High School, as well as one middle school, and two elementary schools: Park and Munson. Hambden and Maple were no longer elementary schools starting in the 2018-2019 school year. Hambden and Munson elementary are not within the city limits. As of the 2011-2012 school year, the district had received an "Excellent" rating from the State of Ohio Board of Education for eleven consecutive years. Chardon has a public library, a branch of the Geauga County Public Library. Tom Kipp, international professional superbike, superstock and supersport motorcycle champion. ^ "Chardon: United States, name, administrative division, geographic coordinates and map". Geographical Names. Retrieved 2015-02-04. ^ a b c City of Chardon - History Archived 2011-08-30 at the Wayback Machine. ^ File:Map of Geauga County Ohio With Municipal and Township Labels.PNG. ^ "Archived copy". Archived from the original on 2012-08-11. Retrieved 2012-05-05. CS1 maint: Archived copy as title (link). ^ Terrible Conflagration. ; The Entire Business Portion of Chardon, Ohio, in Ashes-Loss Over $100,000. The New York Times, August 1, 1868. ^ "Chardon High School Shootings: 3rd Student is Dead". Fox8 Cleveland. February 28, 2012. ^ "FBI, hospitals, say 5 students injured when classmate opens fire at Ohio high school". The Washington Post. February 27, 2012. Retrieved February 27, 2012. ^ "T.J. Lane wears 'Killer' shirt at sentencing; judge sends him to life in prison without parole (gallery, videos)". The Plain Dealer. March 19, 2013. Retrieved March 19, 2013. ^ Schmidlin, Thomas W. (September 1989). "Climatic Summary of Snowfall and Snow Depth in the Ohio Snowbelt at Chardon". The Ohio Journal of Science. 89 (4): 101–108. hdl:1811/23329. ^ Data and Analyses, November 9-14, 1996 in the Great Lakes - WW2010 Archives, University of Illinois. ^ National Agricultural Summary, November 11-17, 1996 - National Agricultural Statistics Service, United States Department of Agriculture. ^ Albrecht, Brian E (1996-11-17). "So much, so soon; Snowfall will have place among stories of survival in Cleveland weatherlore". The Plain Dealer. Retrieved 2008-03-05. ^ "Incorporated Places and Minor Civil Divisions Datasets: Subcounty Population Estimates: April 1, 2010 to July 1, 2013". U.S. Census Bureau. Archived from the original on December 18, 2014. Retrieved December 20, 2014. ^ "Guild restores murals that set the tone for Chardon's 1939, art deco cinema", The Plain Dealer, February 5, 2001. ^ Movies for 4 Archived 2009-02-02 at the Wayback Machine - Geauga Lyric Theater Guild website. ^ About the District. Retrieved from http://www.chardon.k12.oh.us/AbouttheDistrict.aspx. ^ "Locations". Geauga County Public Library. Retrieved 25 February 2018. ^ Kipp on Superbike pole | Auto123.com Retrieved 2018-05-22. 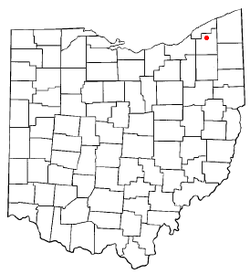 Wikimedia Commons has media related to Chardon, Ohio.